Less a band, more an international creative community, Superorganism is an eight-strong operation that is becoming rapidly renowned for psychedelic slacker-pop with accompanying trippy visuals. We caught up Kiwi band-founder Harry and Maine-raised singer Orono to discuss the roots the the group, how it feels to count Frank Ocean and an array of industry tastemakers as fans, and to hear their plans for 2018. Firstly, congratulations on making the BBC Sound of 2018 longlist. Harry: It’s so crazy. What a trip! What with that, support from Frank Ocean, and appearing on ‘Later... with Jools Holland’, 2017 has been huge for you. What were your original expectations when you put ‘Something For Your M.I.N.D.’ online back in February? Harry: We had no expectations with that really. We just put it online quite inconspicuously. Orono: Like, “This will be cool if we get, like, 200 listens.” That was what I thought. But then it got, like, a million. Harry: Yeah, it just snowballed. You know, all of us have done various musical things in the past but nothing that’s really taken off so we certainly didn’t have hopes that the song would end up with millions of listens. I mean, we had a hope of that, but we definitely didn’t have the expectation of it. So, yeah, when Frank Ocean and all these cool, famous people were into our song, it was just tripping us out. We’re trying to provoke people. A strong reaction is the ideal reaction, whether that’s positive or negative. You must have had to cope with a lot of change in a short space of time? Orono: Well, I moved countries! That’s a pretty big change. Right now we’re doing this weird, touring thing where every weekend we go to a country and play a show, and then come back in a van, taking seven hours, and it’s pretty hectic. Harry: Yeah, it’s kinda like a warm-up for next year when we’re going to be touring a lot more intensely. In terms of the speed of everything that’s happened, I think that when something snowballs this fast, you don’t really have time to stop and take stock of how quickly everything’s moving. It feels weirdly natural in a way, just because everything’s happened so organically. There are these various moments that occur where it hits me in the face, like, “Woah, I’ve played on Jools Holland.” That’s a real mind-blowing moment because you’re literally in the room with Noel Gallagher and Dua Lipa and all these big-name artists, playing just after them. But outside of that, when we’re just living our day-to-day lives it doesn’t feel like we’ve really changed that much, even though circumstances have. So you guys originally met at a gig, right? Harry: Well, there were a few of us that had known each other for quite a long time, and there were a few different people from a few different countries: myself in the UK, Emily from Australia, a couple of guys from New Zealand as well. So we found ourselves living in New Zealand and working together, after meeting through the internet. 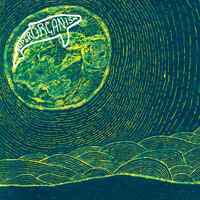 And then one of the projects that we were playing in – which four of the guys that are in Superorganism were in as well –went on tour in Japan in 2015, and Orono was basically home from Maine for the summer and came down for a gig. You found our music through YouTube recommendations, right? Orono: Right. And then I went to their show, and we became friends and started a band. Can you remember your first impressions of each other? Harry: Well, I remember Orono was a massive fan of our old band so it was funny to meet her. Harry: Yeah, so we got chatting. And then because we had a couple of days in Tokyo and we didn’t really know much about the city, Orono hung out with us and she came to another show as well. We’ve all got pretty similar sense of humour and taste in music so just hit it off there, and kept in touch via Facebook. At the start of this year a couple of us were talking about trying to get together a new project that included everyone that was living in our house in Homerton [East London], plus a few more talented people that we knew from around the world. It was just gonna be a recording project so we didn’t need to be limited geographically, and we decided that all the people that lived in our house, plus a friend who was living in Sydney, would be the group. And Orono had been posting these covers online, and a load of her artwork on Facebook, and we were really blown away by her voice and artistic talent, so we asked her if she wanted to try singing on a couple of tracks. ‘Something For Your M.I.N.D.’ was the first thing that we completed, and then it went from there. You mentioned you all have similar tastes. What kind of music do you bond over? We pick up on a hint of Pavement about your music. Are we imagining it? Orono: No, I think that’s a very fair comparison because when they asked me if I wanted to be part of the project I was obsessing over Pavement; it was all I listened to. The way I sing is pretty much influenced by Stephen Malkmus. And you share a record label with him now. Orono: IT’S CRAZY! Just mind-blowing. Yeah, we all have so much respect for Pavement. Harry: We love the attitude of a lot of the 90s indie-rock stuff. When you listen to that stuff it feels like there were no rules for them really; they were happy to draw from all these different places, musically and style-wise, and the sense of humour’s quite deadpan in that way. I think that’s been a massive influence on the band. If you put our song next to a Pavement song we don’t sound just the same as them, but there’s something in the ethos and the attitude that is similar. 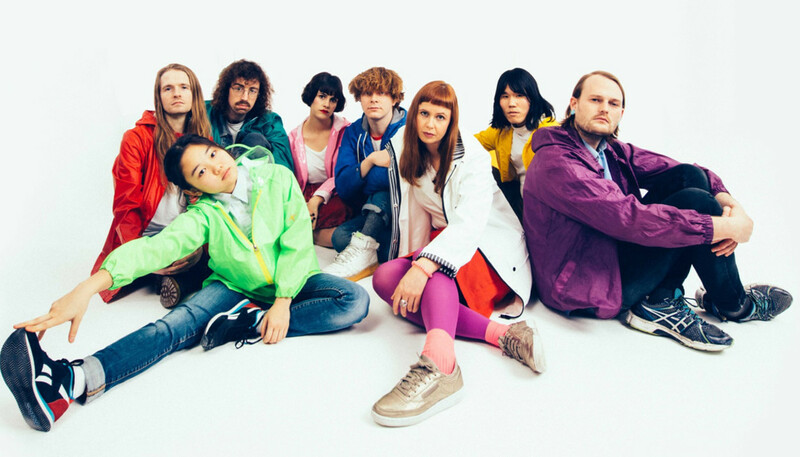 Superorganism is currently eight members strong. How does the creative process work between you all? Harry: It’s haphazard to be honest. There’s a core of us that do the initial songwriting, but we all hang out in the kitchen and listen to music together a lot – showing each other stuff that we like that we’ve not heard before –so that actually played a lot into the process of where the initial inspiration comes from. Then usually there’s a core of us that get the songs together, and one person who does all of our mixing, and then from there we’ve got three backing singers. They all add their own colour and shade once there’s already a bedrock of a track there. For example, the Korean parts in ‘Something For Your M.I.N.D.’ – everyone adds a little bit of their own personality to [the song] at that point. Then once it’s a completed track, Robert is our visual artist and he comes up with all these wild images and videos and live visuals to match the track. The live show has become this full, audio-visual experience, and I think when you tie that in with the music videos as well, the concept that we’ve gone for is to build this Superorganism world that people can get lost in. I think without that visual component that wouldn’t be that. And then at the same time all of our artwork is done by Orono and that in itself has influenced elements of the live show. So it’s all integrated, and we all work together as a team pretty effectively, I think. What, for you, would be the ideal reaction to your music? Harry: We’re trying to provoke people. A strong reaction is the ideal reaction, whether that’s positive or negative. We don’t want mediocrity. The whole process of creating our music and all of the visuals and the artwork that surrounds it is a very stimulative project. We want to overwhelm people with the live show and we want to blow people’s minds with the production on the record as well. We want it to be something people haven’t seen before, and something that makes you curious and draws you in. So what can we expect from your debut album? Harry: It’s pretty wide, really. The whole thing came together so quickly in the first six to seven months of 2017, in terms of the songwriting. I think we’ve got consistency to it but there’s quite a wide range of emotions and feelings that we’re going for. You know, we’ve got songs that are more whimsical and silly and fun, and then we’ve got some more heavy and darker moments as well. I think the nature of having such broad tastes and influences has given us a wide palette to work from. Aside from the album release, what are your plans for 2018? Harry: Pretty much we’re gonna be touring, touring, touring. There’ll be some more music videos. We actually created way more material for the record than what we needed in the end as well, so I’m sure that all of that will be seeing the light of day at some point too. I guess it’s just going to be a continuation of this year, but even more hectic again. We’re gonna see more of the world, take the live show out there and build on everything that we’ve done already. With three songs out there, I feel like we’ve piqued a lot of peoples’ curiosity but I think when people hear this record and the consistency and the quality of it – and the variety of it as well – we’re hopefully gonna solidify ourselves in people’s minds as a band that they love and that they turn to.